Some deities are very appealing to the general pagan population. I have always thought of Brigit as being very approachable. She seems like she would be the perfect counselor and all round best friend, as far as goddesses go. My friend, Blaze, comments frequently of how she has been drawn to Brigit for as long as she can remember. I agree. I like Brigit, too. That’s why I was surprised when I felt I was being approached by a goddess that I never thought of working with before. This was not really a goddess that gave me the warm fuzzies. I had a bad impression of her, through no fault of her own…..probably. She seemed kind of scary, in fact. Her name is Hecate. I was well into my “cronehood” when she started making her presence known. I started “seeing” symbols that made no sense to me. For instance, I would envision keys, and keys would appear everywhere in my physical environment as well. Most of these visions would appear as I was drifting off to sleep at night. One night I saw a woman holding up a torch as I drifted off. Finally, I did what I often do: I “Googled” those symbols and found they were connected to Hecate. So why was a goddess of the underworld calling me? Wasn’t I about healing and angels and light? I decided to research Hecate more. I found that she was a strong protector and even though she is a triple goddess she is often thought of in her crone aspect. Maybe she just likes that I’m “old”, I thought, or that I own a black dog (another of her symbols). Neither of those facts seemed reason enough for her to be contacting me. Then I had a friend tell me of how Hecate had actually healed him in a very powerful experience he would never forget. He was so moved by the experience that it was absolutely life changing. OK, so that made sense. I am a healer. Hecate is a healer. Things were starting to come together. As I read more and more about Hecate, I realized that even though she was not a goddess that you wanted to mess with, she was interested in interacting with us. I was starting to get to know the other side of Hecate that was more like a wise and caring guardian – a protector of witches. The first time I worked with Hecate magickally was when I had a friend who needed some major protection from two other “witches” who were persecuting her in a big way. I was outdoors when I cast the circle and started the protection spell. I was pretty pissed at the two evil women in question, but I tried to work from a place of neutrality. I calmly explained to Hecate the situation and asked for her protection of my friend, a fellow crone. As I finished speaking the verse I had written and began to raise power, ( I kid you not) there was a sudden gust of wind and a thunder clap! The weather had been relatively calm when I cast the circle, but the timing was almost too perfect! “Hey, that was cool”, I thought to myself. Needless to say, the spell got results. 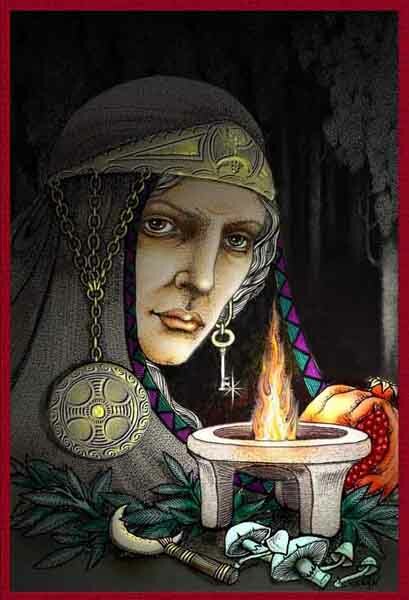 Hecate is a lovely, wise goddess who stands by and listens to what you are telling her. If you ask something of her, she smiles, nods her head as if to say, “Is that what you really want?“ She makes you think things through and is a wonderful teacher. I still read about other gods and goddesses: Airmed for my herbal practice, Aine for the fairies, etc.. But I guess Hecate is my go-to lady when I need some powerful action. Hail Hecate! Blessed be! Blessed be…Hekos , Hekos, Hecate! Would you might putting a link to our site on my Hecate image? Done, Katlyn! Nice to know who designed the image. Thanks.